Bill took this photo in the Lake Erie Metropark (aka Brownstown Park). View his photo bigger and see more in his Birds slideshow. More about Great Egrets on Michigan in Pictures. Many in Michigan are waking up to frigid temps, high wind and snow – the perfect conditions for lake effect snow. 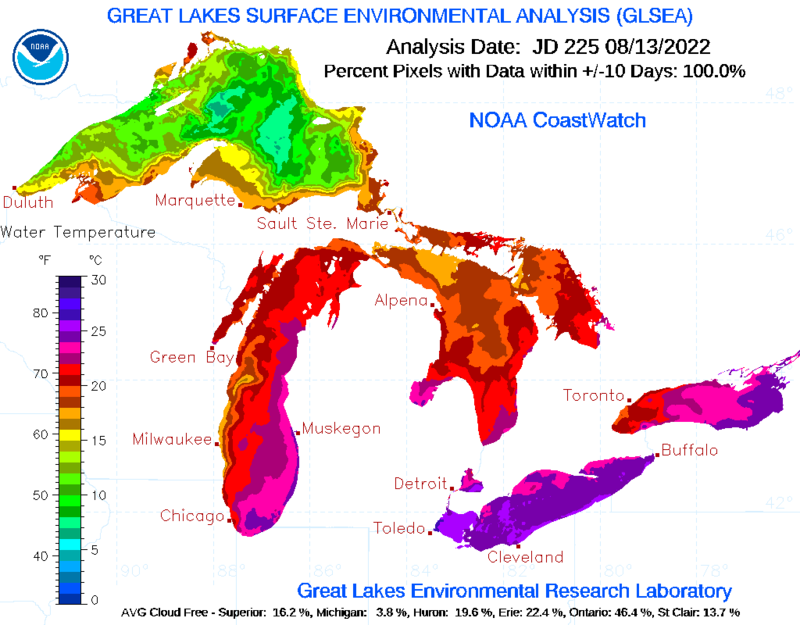 Meteorologist Robert J. Ruhf has an excellent article on Lake-Effect Precipitation in Michigan that explains lake effect snow and rain are common in Michigan, especially in late fall and early winter as cold polar air moves across the warmer Great Lakes. The unfrozen waters are relatively warm when compared with the temperature of the wintertime air mass. Therefore, the temperature of the air that comes into contact with the water increases. The warmed air expands and become less dense, which causes it to rise. This is an “unstable” situation. As the air rises, the temperature decreases until it reaches the dew point, which is the temperature at which the air becomes saturated.. Ice crystals or water droplets will then begin to collect until the force of gravity pulls them down. The result is “lake-effect” precipitation. When the cP air mass is very cold, as is often the case between December and February, the precipitation falls as snow. During late autumn, however, the polar air mass may be warm enough for the precipitation to fall in the form of rain. “Lake-effect” precipitation can cause substantial intensification of snowfall amounts in very narrow bands, often referred to as “snow belts,” along the leeward (downwind) shores of the Great Lakes. The prevailing wind direction in the Great Lakes region is westerly; therefore, most “lake-effect” precipitation events occur to the east of the lakes. …An interesting feature of “lake-effect” is that the heaviest bands of snow do not usually occur along the immediate shoreline, but tend to fall several miles inland. Snowfall accumulations are enhanced inland because the air experiences more uplift when it is forced over hills and higher terrain. Read on to learn lots more about lake effect snow in Michigan including four narrow bands – Keweenaw Peninsula, Leelanau Peninsula, the Thumb and the southwest Lower Peninsula – where geographic features and the shape of the shoreline contribute to more intense snowfall. Hang on to your hats – winter is here! Stacy took this photo of Lake Michigan from the North Muskegon shoreline in January of 2009. See it bigger and see more in her awesome Michigan BLUE Winter 2012 slideshow. On September 10, 1813, nine small ships – six of them, including Niagara, constructed at Erie – defeated a British squadron of six vessels in the Battle of Lake Erie. A pivotal event in the War of 1812, it led to regaining Detroit, lost at the war’s outset, and lifted the nation’s morale. The U.S. Brig Niagara is a two-masted, square-rigged sailing vessel. In 1813, she had a crew of 155 men and boys who manned her sails, 18 carronades and two long guns. The crew was organized into two watch sections (port and starboard) for routine duties while underway. More experienced sailors were stationed aloft, while others under the direction of petty officers manned the rigging which controlled the sails from deck. In battle, men also manned the guns and carronades. Boys carried the black powder charges from the magazine to the guns. Marines and soldiers were assigned to the fighting tops on the masts where they could fire their muskets on the enemy ships. Officers directed setting sails, firing cannon, and maneuvering the brig in response to orders from the captain. …On September 10th, 1813, the British under Commodore Robert Heriot Barclay and the Americans under Perry met in battle near Put-in-Bay, Ohio. Perry’s flagship, Lawrence, engaged the British ships Detroit and Queen Charlotte, while the Niagara, for unknown reasons, did not close the enemy. Read a comprehensive account of the Battle of Lake Erie from the Perry’s Victory and International Peace Memorial. Get a very in-depth account of the Battle of Lake Erie and the events leading up to it from American Heritage Magazine. Find out more about the parties in the battle at Wikipedia. Take an interactive tour of the Brig Niagra. Trish wrote that the Flagship Niagara was in Detroit a year ago for Navy Week to commemorate the bicentennial of the War of 1812. Detroit was chosen as a host city because of its direct link to the War of 1812. The city was an important military outpost in the war — but mainly for the British, who tricked the commander of Fort Detroit into surrendering the city without a shot and occupied it for more than a year. She also says to note the authentic 1812 U.S. flag! Check her photo out bigger and see more in her Detroit slideshow. More ships & boats on Michigan in Pictures.